You may well already know this superb website, but just in case you don’t I feel I have to share it with you. 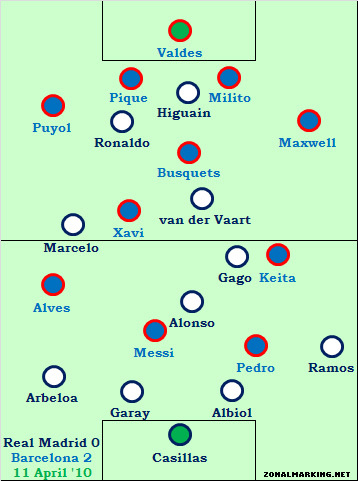 I only discovered Zonal Marking a few weeks ago but I was immediately impressed by the quality of their analysis of Barça games and tactics. They cover football in general and but seem to cover quite a few Barça games. I’ve just spent a couple of hours going through their 40 most interesting games of 2010 where you can read excellent reviews of our Champions League clashes with Inter Milan and Arsenal, both 2010 Clasicos, and Liga games against Villarreal, Valencia, Hercules and Sevilla. As well as an in-depth write up, they include video clips and blackboard diagrams to help the reader’s understanding of the game in question. So, I know you may be just looking for news of Gabi Milito’s impending departure to Malaga (it seems the deal will go through on Sunday), but if you have a bit of free time now you could do a lot worse than to take a look through the Zonal Marking archives. This entry was posted in Gabi Milito, Other, Sites we like and tagged Football, links, Milito. Bookmark the permalink. Thanks Nic for the link. I liked that. It was nice to go back in time. You know what. I miss some followers of the FCBNews blog. Where are you guys? Thumbs up Nic! Not many people will recommend the efforts of others in their own work. Like your spirit and mindset. Really, where are those FCBnews faithfuls?!?!? !